I think Jonas is up in the main skysail. the sail is in the way. Yes, this blog has been hijacked by me. Brian Eve, aka Toolerable because Jonas has been away far too long, I'm sure you are all worried sick about him. Fear not. The Statsraad Lehmkuhl has the latest in internet technology considering what you would expect in a vessel of this vintage. In other words, his connection is so slow, he can hardly websurf, let alone post. Jonas has been able to send me a few emails, however. Hun har heste. Ænder drikker vand. Vi læser aviser. Elefanter og skildpadder er vegetarer. Elefanter spiser ikke svinekød, og drikker ikke vin. Jeg drikker øllene. Kvinder spiser ikke kartofler. Danish is a very serious language, and should be used sparingly. Jonas joined the ship this time in Norfolk, Virginia. He was there long enough to host Don Williams for an evening, which sounded like great fun. We had a cocktail party on Board, and there were several admirals, one 4 star and a 3 star plus a bunch of regular ones. Some generals and the likes too. I talked to a Danish Brigadeer general, and sone of the very high ranking US admirals. The admiral was actually a bit of an accident. Because I was talking and joking about horses with a Portugese colonel who was the chief commanding officer of the Portugese Cavalry officers School. And suddenly this senior admiral was trying to get past us and the Portugese almost jumped to attention and excused so much that we didn't get out of the way immediately. So I felt that I had to explain that it was my fault since I had started talking about horses, but the admiral was OK with it all. But damnit there was a lot of brass! We have passed the Newfoundland banks, and are now well underway towards Norway. Yesterday we saw icebergs, but luckily we didn't crash into any of them. That's always good to know. Sadly the ships bingo tournament was postponed for a day due to the weather. Things are going well out here. We are constantly heeling 20ish degrees to one side except for the occasional dip to 30 degrees. The speed is around 12 knots, and we hope to reach Norway in 3 days. I suppose this means everything on board is as normal as could be on such a ship. Woodworking related, he has told me that on his plans for things to make are finishing up a box he is working on to hold his home-made collection of drafting whales. Also, last time he was home he milled a giant beech log and got several huge slabs for table tops, and also a single, six inch thick slab for another Roubo bench. We all look forward to seeing pictures of these. I'm not exactly sure when Jonas will return from this rotation on his ship, but I'm looking forward to reading on this blog about how his new job is going. For some inexplicable reason we have a bit of teak on board this vessel. The former captain who was on the ship when it was delivered from the yard in India thinks that it came on board at the yard. So far it has escaped being thrown out as garbage due to its sheer size that makes it a bit awkward to move around. I would like to bring it to Denmark and mill it on the sawmill, but my luggage allowances aren't that high. So in a rare moment of sensible brain activity from my side, I offered it to my new ship, since I figured that they would have more use for it than an industrial garbage facility. I haven't measured the actual length of the pieces, but a quick guesstimate is that there are two short pieces of 3' each, and the one long piece is 6'. All the pieces are solid 12x12", so technically it is something like 144 bf of teak. Someone out here for some strange reason decided to crosscut about one foot of the length of one of the pieces. I have no idea why (and no for once it wasn't me who did it). Or is it a treasure? Ash log Roubo project 1, preparing stock. As you might remember, I bought an ash log just at the termination of the DCBE. I didn't have any specific plans for it, but I had to get it processed, since I have a beech log waiting in line for being milled, and since beech is not very rot resistant, I thought that I'd better get moving. I have plenty of 2.25" slabs, so I thought that the best way of getting the log reduced to some useful stuff was to make a 6" slab and start a workbench build. Ash isn't the most classic workbench material, but I still think that it will hold up just fine for regular use. If not I can always glue and tack a piece of plywood on top of it..
With my usual luck, the sawblade for the mulesaw suddenly detonated in the middle of the milling operation. I found my spare blade, and got back in business in fairly short time. I am going to weld the regular blade again, and I have even considered perhaps buying a new blade for the saw. But I am still not sure about that. The trunk was Y-shaped, and there was quite a bit of tension in one side which became visible as the saw blade slowly progressed through the log. Once the slab was milled, I trimmed the ends with a chainsaw, and it became apparent that there was a bit of rot where the crotch of the tree was. So I ended up getting a slab that was a little shorter than I had hoped for. The benchtop slab was edge sawn on the mulesaw as well, since it was too wide to balance on the circular saw. The rest of the 6" thick piece was milled to legs and stretchers on the circular sawmill. It is so much faster than the mulesaw after all. 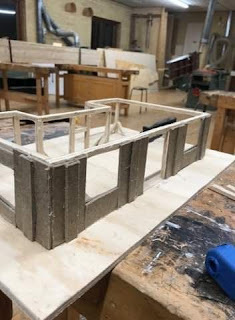 I started out making the legs 6x6", but they looked really clumsy, so I studied Roubo's book, and the text suggests that the legs are made 6x3 or 6x4" which I thought was kind of funny since all the images of workbenches had square legs. Anyway, I decided to go for 3.5 x 6" legs and I still think that they'll be up to the task of holding the top. The material was still wet, but I started working on the top nevertheless. First task was to rout a recess where there was ingrown bark from the two parts of the upper trunk. This was done on both sides of the slab, and a piece of dry whitebeam was glued in. Next up was to install some butterfly keys to reduce any chance of splitting, and also to practice making those. So 4 butterflies went on each side of the slab. I flattened the underside of the slab and then the two sides, and the lesson learned was that it really is a lot easier to plane if the height of the workpiece is correct. The legs and the stretchers were squared up and brought to size using my jointer/planer. Once I get back from the sea, I hope to be able to get the frame completed and install the top on it. 6" x 20" x 80" ash slab. Planing the side (too low a working position). Once again I got inspired to a blog post by Bob the Valley woodworker. He is listing up all the stuff that he has made during the year and compared it to what his plans had been. Years ago I would often feel that I never got anything done, and when I went to sea, I was frustrated and irritated that I hadn't completed anything while at home. I discussed it with my mom, and she told med that she once had the same feeling after a long summer holiday, but her way out of it had been to make a "positive list". This list contained all the things that she had done, some big and some small, but writing them all down had helped her remember that she had done things during the summer, though not all of them were visible. One of the drawbacks of being a seaman is that about a week or so after joining the ship, it is easy to suddenly feel sorry for yourself because you miss your family. If you immerse yourself in that sorry feeling, it is really difficult to get the mood back up again. I think that the same might be true for a lot of other professions/people, maybe people have great ideas and expectations to a summer holiday or a long weekend, and then come Monday - not all that was dreamed of was actually completed. My solution to this has been to write a "positive list". I generally write it one week after coming on board, because that makes me remember the time at home. There are no limits to how small or big a project that can enter the list. If I deem that it was a positive thing - it will go on the list. In the beginning it is easy to think that "nah - this is too silly, I can't write this", but it is your list, so if eating a hotdog on a Friday afternoon make you happy - it can go on that list. Once all those little things are written down, there is suddenly a long list of stuff that you have completed - and you wonder how on earth you had the time to do all that. And then you might forget that you were feeling sorry for not completing one specific part of another project. Washed Bent (horse) with a water hose. Riding in the forest with Mette. Made MiniMax hydroplanes with the boys. Processed a little bit of firewood from the treeline next to the field. Installed new hinges on a door in the stable. Attended Vildbjerg Cup with Asger and Mette (4 day soccer tournament). Attended two FCM games with Asger (pro soccer games). Attended Danmarks Cup Kallehavegaard with Gustav (3 day horse tournament). Picked Up Laura in Viborg upon her returning from Interrail. Driven Laura back to her dormitory after the summer holiday. Visit from Jens in Japan (my younger brother). Driven a lot in the green Volvo Valp. Went to the beach with Bertha numerous times at Sillerslevøre (near our summer house). Had mom and dad visit us. "Delivered" Gustav to his boarding school. Driven Asger and his soccer team to Lemvig for a match. Changed the battery on the Wheelhorse and the ATV. Helped Asger to change a tire on his moped. Had a visit from my coworker and his family. Often there will feature bullet points about food that I have made, or had morning coffee with one of my friends in his garage. The general idea is that all this is something that I feel have contributed in a positive way to me. So if you ever feel just a bit down and sorry for yourself for not reaching all your goals, it might be worth trying to make a list like this. Just remember that nothing is too small to go on the list. If it meant something positive to you, write it down. By keeping those lists, you can later look back at them and remember specific positive moments. Some of them might have been positive to others as well, like giving your wife a bouquet of flowers, or walking the dog etc. Positive moment from November 2018. Very positive moment from December 2018. I have worked for Troms Offshore for the past five and a half years, and I have had a great time. 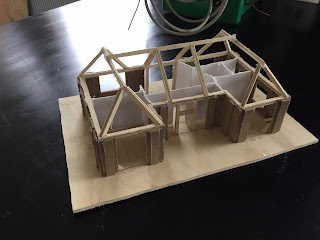 There have been plenty of nice colleagues and I have even managed to sneak in a woodworking project or two during these years. One of my coworkers forwarded a job ad two months ago, and while I wasn't really looking for a new job or planning to change jobs, this particular job seemed interesting. I got so curious about it that I did a bit of research, and ended up sending an application. I truly hadn't expected to hear from the company again, since it was sort of a very special job with a high number of potential applicants who might have a better chance than I did. I told myself that at least I had sent in an application, and I would be happy for whoever landed the position. And since I like it here in Troms Offshore, all would still be well no matter the outcome. Actually I was pretty sure that the pay was lower in the new job, so it really didn't matter much. To make a long story short, they called me one day in the end of November, and I accepted the job despite a lower salary. Most people tend to move towards better paying jobs and newer ships. I on the other hand have done the opposite. In even manage to live up to my motto "Being old fashioned, the cool way". 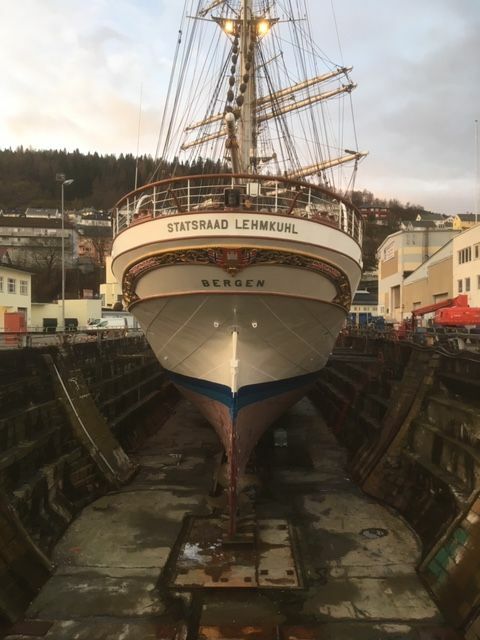 My new job is as chief engineer on board the Statsraad Lemkuhl, a ship built in 1914. 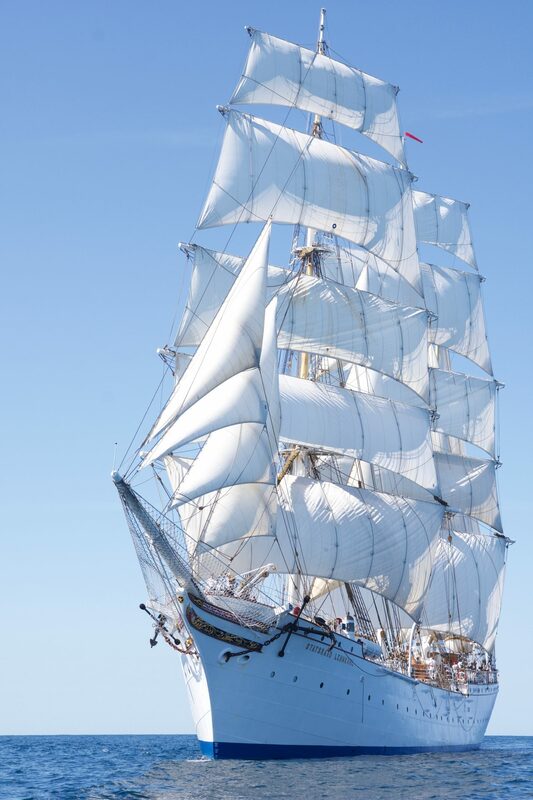 The ship is run by a fund, that has got the goal to keep the ship active, and I read somewhere, that it is one of the tall ships of the world that has got the most sailing days per year. That appeals very much to me, since the ship was built for sailing, and not for being in port like a museum ship. It will be a new experience for me, but like trying out new techniques, it can't hurt to use you brain once in a while to learn new stuff. Another good thing is that the ship usually visits USA once every year, so that is a bit of an adventure on its own. 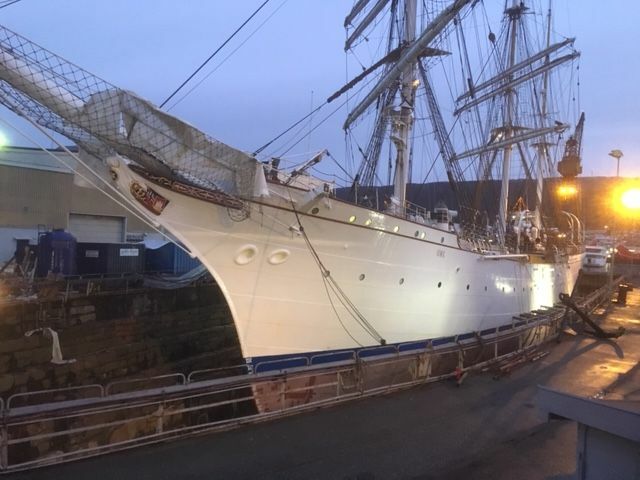 The ship is in dry dock prior to this years season. Definitely prettier than an offshore supply boat. While I am at home, I like to go to the forest for a walk with Bertha. The best days are the Thursdays, because Mette has got that day off. We have started kind of a tradition where I walk Bertha and Mette brings Bent (her horse). I go for one "round", and Mette and Bent moving faster takes two rounds, Then we meet up and go for a walk in a small group with Bertha in the lad, I follow her and Bent follows exactly in my footsteps, so Mette can loosen the reins of him. The Thursday before I went back to work, and Despite Mettes warnings, I tried to tie Bent to the side of the trailer while I helped to put on his saddle. Bent is a very calm horse, but he doesn't like to be tied to a trailer, and he demonstrated that very clearly by jerking his head forcefully - and breaking the leather halter. Mette got a bit irritated, since she had told me this, but I calmed her down by promising her that I would repair the damage. After all I made the halter myself about a year ago, so I knew that I could do it. 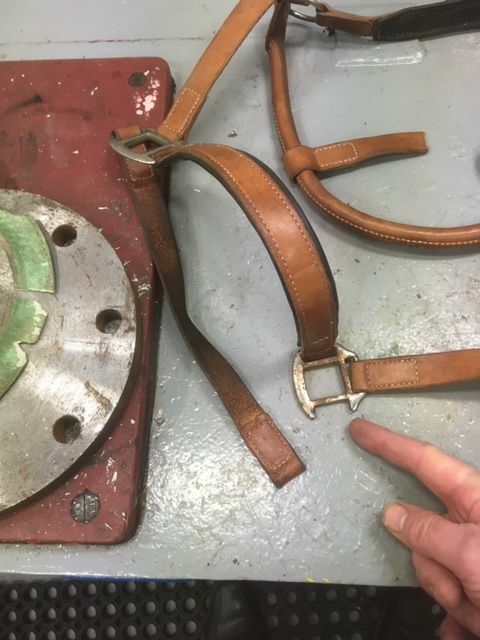 As it can be seen in the pictures, Bent broke a piece of hardware and snapped a piece of the leather. I guess it took something like half an hour to repair the halter, and it was an easy job to do on board. 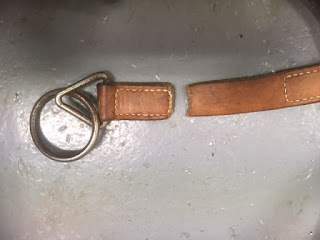 I had brought a few leather working tools with me, and a strip of leather in the correct width.